Last week I watched Dawn of the Planet of the Apes and it stirred me enough write a piece on it. Although Koba blasting two machine guns while riding a horse into battle trumps Optimus Prime atop Grilock for this summer’s epic image – this is NOT what compelled me to type. What was compelling was the virtual characters – the apes and the pure accomplishment of Weta Digital in successfully convincing audiences that Caesar et al. were as real and present as any of the human cast. I guess in a way, they were present – the performance capture was carried out on location. This in itself is an indication that the lines between real and virtual characters are blurring more and more. 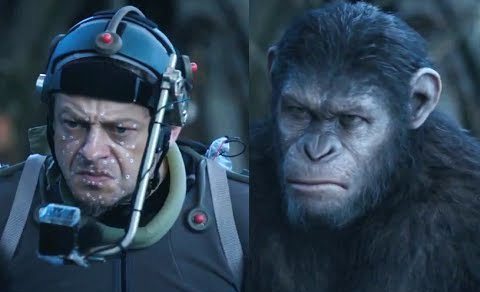 The sweat and energy of Andy Serkis’s efforts in bringing virtual ape Caesar to life were made right there on set. Being on set, trading chops with the real actors gave the apes an extra level of realism; a validity to the motion capture performance technique to those who still doubt that motion captured performances have much value. It’s clear to see how much of Serkis’s performance is translated into Caesar thanks to the latest Mo-Cap tech. One of the most powerful scenes was when the recovering Caesar talks to his son during the final quarter of the movie. It was a strange feeling in that I knew that I was watching two virtual characters converse but at the same time, I forgot that I was watching two virtual characters converse. It was both technically awesome and dramatically compelling and I felt a sense of hope that there’s so much ahead for virtual characters who interact with themselves, real people and their audience. The shot that really demonstrates the confidence in the technology was the very first one. A lingering extreme close up on Caesar’s face, close enough to read his eyes. So important – because as the audience, this is where you’ll decide whether you’re going to believe in this character or not. Any VFX which are less than amazing here will make for a sucky first impression and potentially ruin your relationship with Caesar. The shot slowly pulls back and instead of the unsettling, dolls eyes (as Quint would say) of Polar Express, you have something alive. You see something which is thinking and considering its options – you see Caesar the ape. The achievement belongs to both the actors in the performance capture roles and the artists at Weta Digital. On that note of shared achievements though…as the quality of motion capture characters (theVFX and the performance itself) evolves, surely it wont be long until the likes of the Academy Awards develop a category for the performance, just like they created a category especially to reward Rick Baker for his work on American Werewolf in London. But there’s a valid debate as to just how much of the believability comes from Serkis OR from the animators who receive the motion captured footage and add all the subtleties. A hell of a lot of work and research goes into both sides. 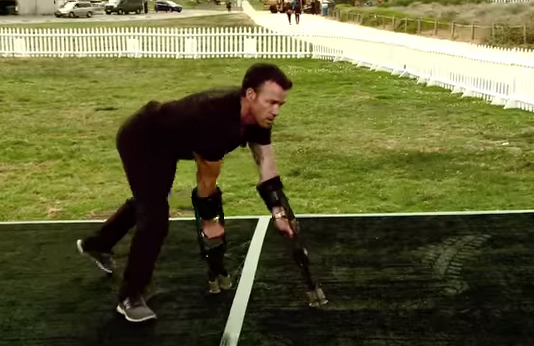 It’s not like choreographers such as Terry Notary bring very little to the table, it’s not like you could just stick a motion capture suit on just anyone and expect to get the same depth of performance that Serkis gives. Equally, it’s not like digital artists just need to press the “render” button once they have the motion capture performance on file. It’s also not like animators don’t invest time in any of the characters they help bring to life. It seems that animators who work on motion capture performances influence a performance in the same way that editors, lighting and directing can all shape a performance from a real, flesh and blood actor. It’s Daniel Day-Lewis or Anne Hathaway alone that steps up to receive their Oscar or whatever. However, it’s unfortunate that this should be the case; even less recognition for artists in an industry that already feels undervalued by studios. But awards are questionable – what interests me is where its all headed from an audience’s point of view. When does a virtual character become “real” to you? What is it about the performance that convinces you that what you’re seeing is real? Where will the technology take its virtual characters in the next few years? With this level of craft, the nature of this performance – it’s ALL about the collaboration. The debate on who should receive the final recognition for it doesn’t affect the evolution of the technology or ideas on how to integrate digital characters into a story – for me right now, this is the most exciting part.